2019 Hawai'i Island Steel Guitar Festival is tentatively scheduled for December 13-15, 2019. The Mauna Lani, Auberge Resorts Collection, will reopen on December 13, 2019. The hotel wants the Hawai'i Island Steel Guitar Festival to kick off its grand re-opening, and details are still being worked out between the hotel and HIMELE, the festival's producers. Please check this website for information about the 2020 Hawai'i Island Steel Guitar Festival. 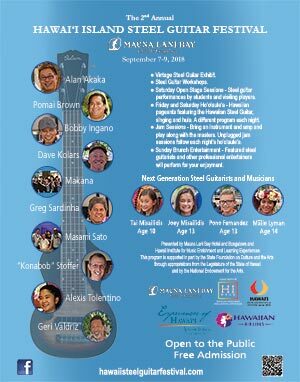 The 2nd Annual Hawai'i Island Steel Guitar Festival was held on Friday through Sunday, September 7th through 9th, 2018, at the Mauna Lani Bay Hotel and Bungalows on the Kohala Coast of the Island of Hawai'i. This festival featured steel guitar performances by Hawai'i steel guitar masters, workshops, jam sessions where festival guests played along with the steel guitar masters, and Open Stage sessions where amateur and professional Hawaiian Steel Guitarists presented their own program to festival guests. The festival was presented free to the public by the Mauna Lani Bay Hotel and Bungalows and the Hawaii Institute for Music Enrichment and Learning Experiences (HIMELE) in association with the Ke Kula Mele Hawai'i School of Hawaiian Music, with grants and support from corporate partners, and private donors. This program was also supported in part by the Hawaii Tourism Authority and the State Foundation on Culture and the Arts through appropriations from the Legislature of the State of Hawaii and by the National Endowment for the Arts. This year's festival was held in advance of the hotel closing on October 1, 2018, for a major renovation project. When reopened in December, 2019, the hotel will be known as the Mauna Lani, Auberge Resorts Collection.